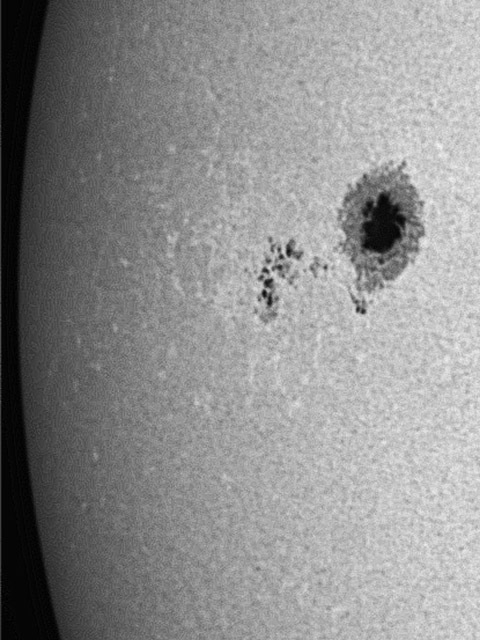 A quick spot of solar astrophotography with ZWO ASI120MC camera on Sunspot AR2529 using Baader solar film white light filter. Nice to see some detail coming through with a faster frame rate camera, although I’ve over processed the stacked image, and now regretting not getting a mono version instead. Mono is more advantageous, especially for when using the Coronado PST in Hydrogen alpha as this is only captured through the red channel on a colour camera, in effect, only using 1/3rd of the camera. Solar white light filter only has white colour coming through, false colour is added later. Sunspot AR2529 is the largest sunspot of 2016 and wide enough to swallow the Earth twice.